Riot Agents – These are less-lethal chemical agents that are often used for crowd control. CS gas and basic pepper spray are the most well known types. Blister Agents – These chemicals cause large puss filled blisters to develop on those exposed. They can cause death from skin exposure or inhalation. 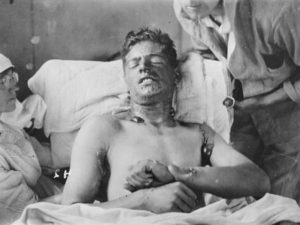 The most commonly known type is Mustard gas. Blood Agents – These agents are less common, but are very hard to detect. They are fact acting poisons that are colorless gasses with very little odor. Blood agents are absorbed into the blood stream and prevent the blood cells from absorbing oxygen. Hydrogen cyanide is the best known example of a blood agent. Choking Agents – These chemical agents prevent the lungs from absorbing oxygen, causing a ‘drowning’ type of death. Phosgene and Chlorine are both good examples of choking agents, but accidental chlorine spills are classified as HAZMAT accidents rather than chemical attacks. Nerve Agents – These agents are deadly in extremely small concentrations- some can kill with a drop the size of the end of a pin. They cause convulsions and seizures that end in death. The most commonly known types are Sarin (used about 10 years ago in a Tokyo subway attack) and Vx (recently used to kill the brother of Kim Jong Il, the leader of North Korea). Chemical attacks can be planned out with SCUD missiles or a can of pepper spray, and the effects can vary just as widely too. While attack occurrences and stockpiles of chemical weapons have both been steadily dropping, the threat is still present. The severity of a chemical attack depends on many different conditions. The type of chemical, the way it is dispersed, and the targets can all affect the severity of the attack. The worst case severity would be a series of coordinated nerve agent attacks dispersed with cluster bombs over a large urban area. Lesser known avenues of attack would also include attacking livestock, crops, and water sources. A chemical attack on food or water infrastructure could have dire consequences on the population. Coordinated chemical attacks could cause deaths in the millions. There was at one time enough nerve agent to easily kill every living person, but anti-proliferation efforts have burned much of the known stockpiles. While it is possible TEOTWAWKI could be caused by a series of coordinated chemical attacks, it is extremely unlikely and impractical. Chemicals cannot spread like biological weapons, and are less destructive than nuclear weapons. The mechanism to effectively disperse widespread lethal chemicals would just as effectively deliver nuclear or biological weapons which would likely have a greater impact. 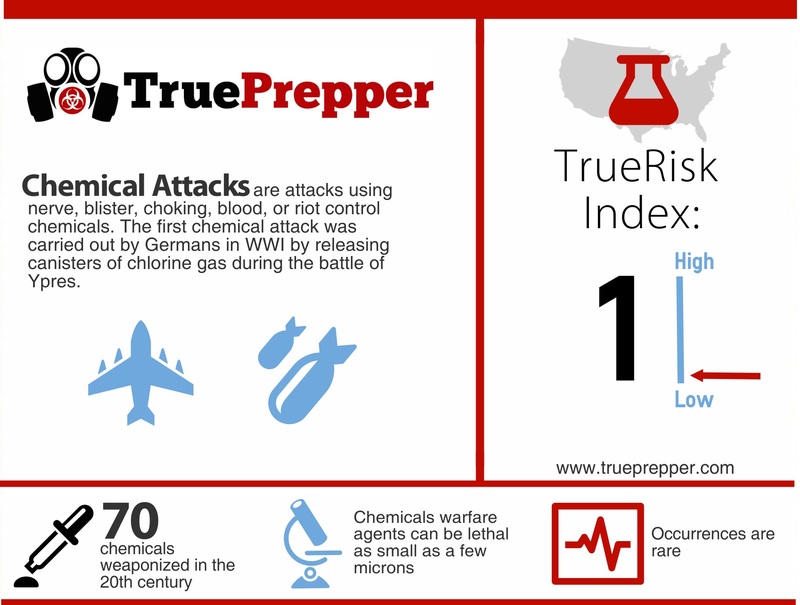 Chemical attack risk is very low with a 1 on the TrueRisk index. The weapons of choice for nations have become nuclear weapons due to the ability to precisely target and the immediate effect. Chemical weapons are not typically favored by terrorist because they are too costly to develop and maintain. A biological weapons program is much cheaper, and a nuclear program is much more effective. Chemical attacks settle in the middle range area where they are really only cost effective as a surprise attack, assassination attempt, or when used from old munitions supplies. Attacking food or water supplies with chemicals is planned against with monitoring at most processing facilities. This is also less of a risk simply due to biological attacks being better suited for this as well. Your risk of chemical attack goes up very slightly if you live in urban areas or near a military installation. Luckily, chemical weapons can be prepared for. Personal protection in the form of gas masks and full coverage clothing can do wonders. Shelter in place is a particularly effective plan for chemical attacks since most chemical weapons do not persist for very long when exposed to air. Prepping for chemical attacks may be simple, but it requires diligence in practice to avoid contamination. A cheap shelter in place kit is going to be the most important gear to own to ride out a chemical attack. A close second would be personal protective equipment. These kits are needed to even consider using your basic survival kit and/or bug out bag. Stay calm and don your PPE if you have it. The next step is to make a quick decision on whether to bug out or shelter in place. If you are not in close proximity to the detonation point, you may have time to leave the area if you deem that the best course of action. Sheltering in place may be an option if you have the tools to do so. Turn off all HVAC and fans, and tape up all entry points with plastic sheeting to make a room air tight. Rooms at higher elevations are usually better, since most chemical agents are heavier than air. Setting up a room at a second story or higher is preferable to ground level. Bugging out should be done perpendicular to the wind direction. If the wind is blowing hard enough, you may not be able to outrun the attack downwind. Most chemical agents will evaporate and dissipate during a 72 hour period. If they were disseminated in liquid form they may last slightly longer. Decontaminating all essential gear that was exposed should be a priority. Weathering is a great method of decontamination, but if you do not have time to expose the equipment to the elements, charcoal absorption, bleach baths, and other methods could be used.